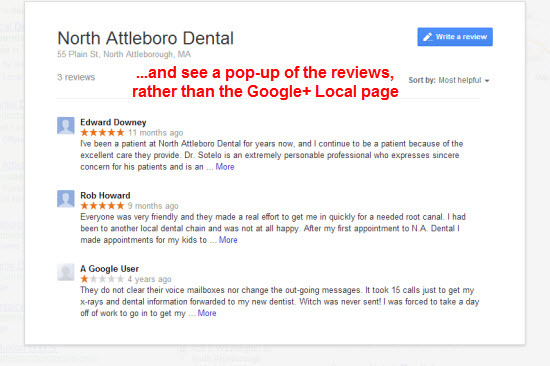 You may have noticed the annoying pop-up (or lightbox) that appears when you click on a business’s “reviews” link in the Google+ Local search results. Andrew Shotland discovered this review pop-up two days ago. How about taking a couple minutes to go read his two posts on it (if you haven’t already), and then loop back here. It is going to evolve. Fast. Why? Because Google is pushing people to write reviews, but it’s not getting people onto businesses’ Google+ Local pages. There’s not even a link on the pop-up that you can click on to visit the Google page. Businesses won’t use Google+ if their business pages are cloaked from potential customers, and customers won’t write reviews on Google+ unless and until the pop-up does a better job of enticing and inviting them to write a review (think Yelp). There is no mention of Google+ – neither in the pop-up nor in the steps you’d follow to post a review from within the pop-up screen. That fact alone is very weird, and suggests to me that all we’re seeing at this stage is a bare foundation that Google will build on. Assuming the pop-up sticks around, Google will stuff it like a Thanksgiving turkey with knick-knacks meant to boost engagement with Google+ (“Follow” buttons, “+1” buttons, check-in invitations, etc.). 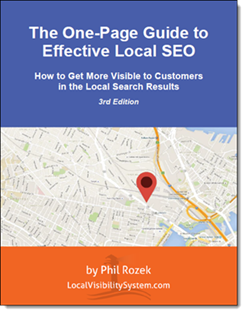 This is a slight bonus for business owners who have upgraded their Google+ Local listings to include all the social features, because the “Google+ page” link still takes searchers to the Google+ page, rather than to the pop-up. Now is the time to get Google reviews from customers. Last year wasn’t, because of the draconian review filters. The review filters are still here, of course, but this year Google has made it clear that they really want more Plus reviews: First they relaxed the filter, then they put reviews front-and-center in the “new” Google Maps and in the local carousel, then they started showing the review stars again, and now they’ve introduced the pop-up. Google is making it (relatively) easy for you and for your customers. What are your thoughts on the pop-up? Hey Phil thanks for the post. I wasn’t sure if the pop up feature was new or not. I look at listing all day and everyday and sometimes things can become a blur. You’re quite welcome on the post. I know what you mean about how things become a “blur”! Clarification Question – “upgraded their Google+ Local listings to include all the social features” means what exactly? That you can post updates on the Google+ page for the business listing? Thanks Phil – that’s what I thought but I wanted to double check.